LOS ANGELES (AP) — The Houston Astros placed starting pitcher Lance McCullers on the 10-day disabled list Sunday with right elbow discomfort and activated right-handed reliever Roberto Osuna. Osuna was acquired from the Toronto Blue Jays in a trade-deadline deal last week and is coming off a 75-day MLB-imposed suspension for violation of the league’s domestic violence policy. 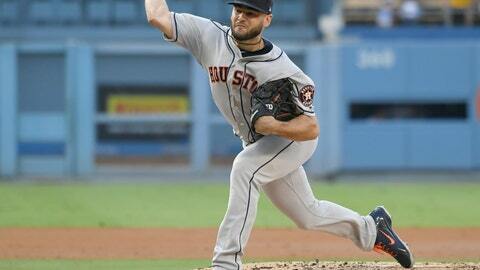 McCullers pitched four scoreless innings Saturday against the Dodgers but left as he warmed up for the fifth inning. Astros manager A.J. Hinch said he will take advantage of some upcoming days off and go with a four-man rotation through the middle of August. McCullers returned to Houston on Sunday morning to get a more detailed examination from team doctors. McCullers is 10-6 for the World Series champion Astros with a 3.93 ERA in 22 starts.